THIS ARTICLE CONTAINS A WALKTHROUGH FOR DESERT OF DARKNESS. WE WILL UPDATE THIS AS WE GO ALONG. This page contains a walkthrough on the quest “Desert of Darkness” in Dragon Quest Heroes II. Most of the terms here are based on the Japanese version of the game, so some terms may not be translated clearly. We will be updating this when the English version of the game comes out in April 25, 2017. 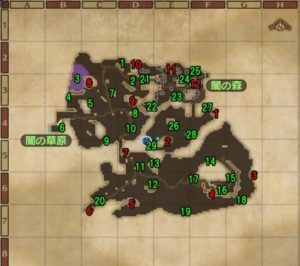 Click here to go the Main Quest Walkthrough Directory! Item locations are highlighted in green numbers. Some items may appear randomly.